Sometimes bad things happen to good people. Sometimes the adversity that strikes a good neighbor is so serious that even life essentials, like having a roof over your head, take a back seat to the crisis at hand. 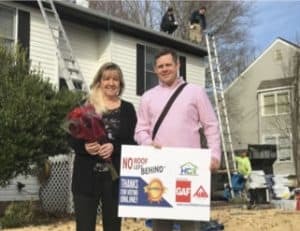 In 2009 No Roof Left Behind was specially designed to help communities organize and rally around a local family in need. 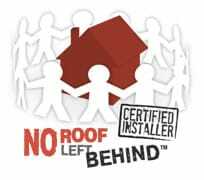 Homefix Custom Remodeling is proud to be a Certified Installer with the No Roof Left Behind Program. 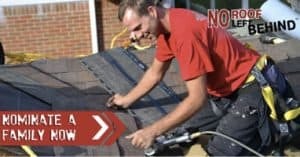 We began in 2016, and have successfully installed roofing for customers free of charge. You don’t need to be a roofing professional to help support this great program. As a community member, you can make a financial contribution to the organization, or volunteer your time on installation day by helping support the crew in a non-construction fashion. Please join us in making a difference. To learn more, visit https://noroofleftbehind.com.